A tile is a manufactured piece of hard-wearing material such as ceramic, stone, porcelain, metal, or even glass. Tiles are generally used for covering roofs, floors, and walls. In addition, special tiles may be used to cover areas such as tabletops and ceilings. The word tile is derived from the French word tuile, which is, in turn, obtained from the Latin word tegula, meaning a roof tile composed of baked clay. Less precisely, the modern term can refer to any sort of construction tile or similar object, such as rectangular counters used in playing games. In the past 20 years, the technology surrounding porcelain tiles and glass tiles has advanced, moving both from a niche marketplace to a place of prominence in the tile community. Flat tiles - the simplest type, which are laid in regular overlapping rows. This profile is suitable for stone and wooden tiles, and most recently, solar cells. Roman tiles - flat in the middle, with a concave curve at one end and a convex curve at the other, to allow interlocking. Pantiles - with an S-shaped profile, allowing adjacent tiles to interlock. These result in a ridged pattern resembling a ploughed field. Mission or barrel tiles are semi-cylindrical tiles made by forming clay around a log and laid in alternating columns of convex and concave tiles. Roof tiles are 'hung' from the framework of a roof by fixing them with nails. The tiles are usually hung in parallel rows, with each row overlapping the row below it to exclude rainwater and to cover the nails that hold the row below. The earliest finds of roof tiles are documented from a very restricted area around Corinth (Greece), where fired tiles began to replace thatched roofs at two temples of Apollo and Poseidon between 700-650 B.C.E. Spreading rapidly, roof tiles were within fifty years in evidence for a large number of sites around the Eastern Mediterranean, including mainland Greece, Western Asia Minor, Southern and Central Italy. Early roof tiles showed an S-shape, with the pan and cover tile forming one piece. They were rather bulky affairs, weighting around 30 kilograms each. Being more expensive and labor-intensive to produce than thatchet, their introduction has been explained with their greatly enhanced fire resistance which gave desired protection to the costly temples. The spread of the roof tile technique has to be viewed in connection with the simultaneous rise of monumental architecture in archaic Greece. Only the appearing stone walls, which were replacing the earlier mudbrick and wood walls, were strong enough to support the weight of a tiled roof. As a side-effect, it has been assumed that the new stone and tile construction also ushered in the end of 'Chinese roof' (Knickdach) construction in Greek architecture, as they made the need for an extended roof as rain protection for the mudbrick walls obsolete. These are commonly made of ceramic or stone, although recent technological advances have resulted in glass tiles for floors as well. Ceramic tiles may be painted and glazed. Small mosaic tiles may be laid in various patterns. Floor tiles are typically set into mortar consisting of sand, cement, and oftentimes a latex additive for extra strength. Today, the spaces between the tiles are filled with sanded or unsanded floor grout, but traditionally mortar was used. Natural stone tiles can be especially beautiful. However, as a natural product they are often less uniform and require more planning for use and installation. Stone tiles described as "gauged" have very uniform width and length dimensions; "ungauged" stone tiles may vary from their nominal dimensions. Stone tiles such as granite can be sawn on both sides (and then polished on the facing up side) so that they have a uniform thickness. Other natural stone tiles such as slate are typically "riven" (split) on the facing up side so that the thickness of the tile varies from one spot on the tile to another and from one tile to another. Variations in tile thickness can be handled by adjusting the amount of mortar under each part of the tile, by using wide grout lines that "ramp" between different thicknesses, or by using a cold chisel to knock off high spots. Some stone tiles such as polished granite and marble are inherently very slippery when wet. Stone tiles with a riven (split) surface such as slate or with a sawn and then sand-blasted surface—granite is occasionally prepared this way—will be more slip resistant. Ceramic tile for use in wet areas can be made more slip-resistant either by using very small tiles so the grout lines act as grooves, or by imprinting a contour pattern onto the face of the tile. The hardness of natural stone tiles varies such that some of the softer stone tiles are not suitable for very heavy traffic floor areas. On the other hand, ceramic tiles typically have a glazed upper surface and when that become scratched or pitted, the floor looks worn; the same amount of wear on natural stone tiles is be less noticeable. Natural stone tiles can be stained by spilled liquids; they must be sealed and periodically resealed with a sealant in contrast to ceramic tiles which only need their grout lines sealed. However, because of the complex, non repeating patterns in natural stone, small amounts of dirt on many natural stone floor tiles do not show. Most vendors of stone tiles emphasize that there will be variation in color and pattern from one batch of tiles to another of the same description and variation within the same batch. Stone floor tiles tend to be heavier than ceramic tiles and somewhat more prone to breakage during shipment. 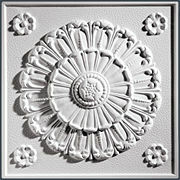 Ceiling tiles are lightweight tiles used in the interior of buildings. They are placed on a steel grid and, depending on the tile selected, may provide thermal insulation, sound absorption, enhanced fire protection, and improved indoor air quality. Also frequently called ceiling panels, or drop-ceiling tiles, they offer the advantage of easy access to wiring and plumbing above the ceiling grid, and can be easily changed, removed, or replaced as needed. They are fabricated from perlite, mineral wool, plastic, tin, aluminum, and fibers from recycled paper. They frequently have patterns comprised of holes, to improve their sound absorption properties, though many have a molded surface providing a textured, sculpted, or pressed-tin look to the ceiling. Some tiles are available with decorative photo/transfer surfaces, some are approved for installation under fire suppression sprinkler heads so the sprinklers do not show, some are approved for use in food preparation areas, and some are certified for indoor air quality by the GreenGuard Institute. Various types of special tiles are available, some of which include mold and moisture damage resistant tiles, tiles with enhanced acoustical properties, and tiles that can be easily trimmed with household scissors. Recycling old tiles depends upon the material used to make them, and some landfills no longer accept traditional mineral fiber tiles, so they must be recycled to the manufacturer. Some plastic tiles can even be left for curbside pickup with other household recyclables. Decorative tilework typically takes the form of mosaic upon the walls, floor, or ceiling of a building. Although decorative tilework was known and extensively practiced in the ancient world (as evidenced in the magnificent mosaics of Pompeii and Herculaneum), it perhaps reached its greatest expression during the Islamic period. Some places, notably Portugal and São Luís, have a tradition of tilework (called azulejos) on buildings that continues today. In the United States, decorative tiles were in vogue, especially in southern California, in the 1920s and 1930s. Perhaps because of the tenets of Islamic law (sharia) which disavow religious icons and images in favor of more abstract and universal representations of the divine, many consider decorative tilework to have reached a pinnacle of expression and detail during the Islamic period. Palaces, public buildings, and mosques were heavily decorated with dense, often massive mosaics and friezes of astonishing complexity. As both the influence and the extent of Islam spread during the Middle Ages this artistic tradition was carried along, finding expression from the gardens and courtyards of Málaga in Moorish Spain to the mosaics of the Hagia Sophia in Constantinople. A special kind of Islamic tiles, Azulejo, are small glazed tiles with Arabic text that are used as dadoes in palaces and courtyards. Certain shapes of tiles, most obviously rectangles, can be replicated to cover a surface with no gaps. These shapes are said to tessellate (from the Latin tessera, “tile”). For detailed information on tilings, see the tessellation page. ↑ Orjan Wikander, “Archaic Roof Tiles the First Generations,” Hesperia 59 (1) (Jan.–Mar. 1990), p. 285. ↑ William Rostoker; Elizabeth Gebhard, “The Reproduction of Rooftiles for the Archaic Temple of Poseidon at Isthmia, Greece,” Journal of Field Archaeology 8 (2) (Summer 1981), p. 212. ↑ Marilyn Y. Goldberg, “Greek Temples and Chinese Roofs,” American Journal of Archaeology 87 (3) (July 1983), p. 309. Goldberg, Marilyn Y. “Greek Temples and Chinese Roofs.” American Journal of Archaeology 87 (3) (July 1983): 305-310. Rostoker, William and Elizabeth Gebhard. “The Reproduction of Rooftiles for the Archaic Temple of Poseidon at Isthmia, Greece.” Journal of Field Archaeology 8 (2) (Summer 1981): 211-227. Wikander, Orjan. “Archaic Roof Tiles the First Generations.” Hesperia 59 (1) (Jan.–Mar. 1990): 285-290. This page was last modified on 9 December 2015, at 17:04.